There are any number of reasons for itchy skin – it can be as simple as dry skin and easily fixed with moisturizing lotion. 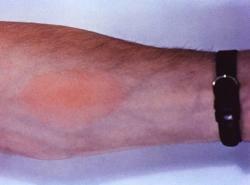 But itchy skin can also be an symptom of a range of other problems that require medical attention. When itchy skin includes a rash, we recommend you drop by the nearest FastMed Urgent Care medical clinic and get it checked out. Medical professionals at FastMed will diagnose your condition and get you started treating your itchy skin. FastMed is walk-in clinic, so no need to wait for an appointment – come as soon as you can. We accept most major insurance plans and do testing in our on-location laboratory, so you get your test results fast. There are many conditions that can cause itchy skin. Here are a few that may require medical treatment, depending on the location of the body and the severity of the symptoms. Eczema (Atopic Dermatitis) The symptoms of eczema may include a red rash, blisters, and dry, cracked skin. Itchy skin is common and can be severe. The skin may become painful, with stinging or burning. Take short warm showers using a mild soap and moisturizer. If over the counter creams or pills don’t work, come to FastMed and let the doctor help. Poison Ivy: If you’ve come in contact with poison ivy, you’ll have a blistered rash where ever the oil resin in the plant has touched you. Make sure you wash everything you were wearing. and wipe down your shoes to remove the oil. If the rash spreads to your face or genital area or covers a large area of your body, come in to FastMed. Allergic Reactions: Whether it’s exposure to cat dander or eating food containing MSG, an allergy is the body reacting to a substance it considers toxic. Come to FastMed for treatment to help with hives or other skin irritants. Please make sure you tell the healthcare professional about your history with allergies.